WHIPPANY, N.J., Jul. 14 /CSRwire/ - Bayer and the White Ribbon Alliance (WRA) announce that two years into their partnership and less than one year from community project launch, their Every Woman Every Child commitment to empower women to practice self-care has reached 1,200 women in 91 communities across four developing countries. 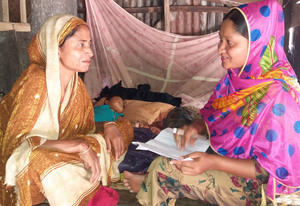 The announcement comes after the July 2016 release of self-care policy recommendations from Bayer and WRA, and the partnership’s launch of local community programs to support the reduction and prevention of maternal, newborn and child mortality in developing countries including Bangladesh, Zimbabwe, Indonesia and Bolivia. The partnership is key in Bayer’s commitment to continuing progress in this critical time of need, as outlined in public policy recommendations released by White Ribbon Alliance and Bayer in 2016. The policy paper, “Self-Care: A Cost Effective Solution for Maternal, Newborn and Child Health for All,”underscores the potential of self-care to drive forward recommended global policies and interventions. White Ribbon Alliance is a powerful network of advocates working for maternal and newborn health and rights at the local, national and global levels. With members throughout Africa, Asia, Europe and the United States, WRA mobilizes citizens, helping them recognize and seize their power to demand that all women and their children are safe and healthy before, during and after childbirth. For more information, visit our website at whiteribbonalliance.org.